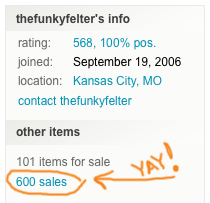 The Funky Felter: 600 Etsy Sales! Woohoo! Reached My Year-end Goal a Little Early! 600 Etsy Sales! Woohoo! Reached My Year-end Goal a Little Early! I got that golden notification email from Etsy this afternoon that I had made a sale. It was a very special email because it was my 600th sale in my Etsy shop. I've been on Etsy a little over three years so it has taken me a while to get there, but it feels good to hit this milestone and my year-end sales goal a little early. A big "THANKS" to all my loyal customers over the years!! I really appreciate your business! And thanks to Etsy to for being such a good selling venue.